Old postcards for sale is a work in progress. I am regularly adding new pages for towns and cities which have vintage postcards for sale. It's a slow process but please bookmark the site and revisit when you can to see what's new. I have added a new A-Z navigation menu which lists pages alphabetically. There are a few pages for you to browse and this will increase as I add more pages over time. Bamforth postcards or saucy seaside postcards are always a popular choice. Lots of innuendo and giggles. 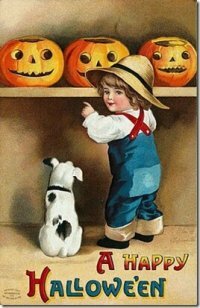 Halloween is always a popular time of year and there are some beautiful postcards featuring Halloween images.